Saudi King Salman announced Friday an agreement with Egypt to build a bridge over the Red Sea connecting the two countries, on the second day of his visit to Cairo. The monarch made the announcement in televised comments after meeting Egyptian President Abdel Fattah al-Sisi, and before representatives of the two countries began signing investment deals. connecting the two countries,” Salman said. “This historic step to connect the two continents, Africa and Asia, is a qualitative transformation that will increase trade between the two continents to unprecedented levels,” he added. 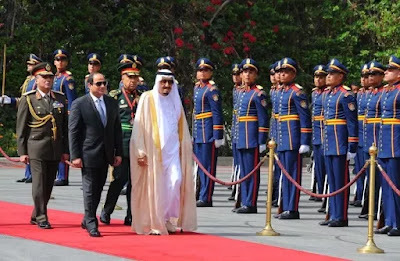 A beaming Sisi, who had minutes before presented the king with the ceremonial Nile Collar, suggested they name the bridge “King Salman bin Abdel Aziz Bridge”. A government official had said the deals agreed with Saudi Arabia throughout Salman’s visit would amount to about $1.7 billion (1.5 billion euros). They included an agreement to set up a university and homes in South Sinai, and a power plant.